Carrots are one of the best and versatile ingredients to be included in juicing. It is mild in taste, rich in health benefits, and mixes well with almost any other fruits and vegetables. Even though carrots have high sugar content, surprisingly it is also a very good blood sugar regulator. Carrots are very low in calories, at about 28, per 100 grams. Freshly-extracted carrot juice has a low glycemic index count of 80. Its consumption is encouraged for its rich nourishment and carotenoid content that help balance blood sugar. Depending on its variety, carrots can be as short as two inches or as long as three feet, with a diameter of between half an inch to over two inches. Carrot is one of the most healing foods that provides the finest and highest quality in nutrients, especially when consumed in its juice form. It is an excellent source of pro-vitamin A, vitamins C, D, E, K, B1 and B6. It is rich with biotin, potassium, calcium, magnesium, phosphorus, organic sodium and some trace minerals. Carrot greens/tops are edible. It has high contents of potassium, calcium, magnesium and protein. Potassium is a key mineral in our body, thus high consumption of it keeps all the organs in our body in tip-top condition. The known phytonutrients in carrots are lutein, lycopene, antioxidants alpha, beta and gamma carotenes, anthoncyanins, lutein, zeaxanthin and xanthophyll. You don’t need to remember these fancy names, but just remember that phytonutrients are nature’s marvelous provision for healing of various diseases. 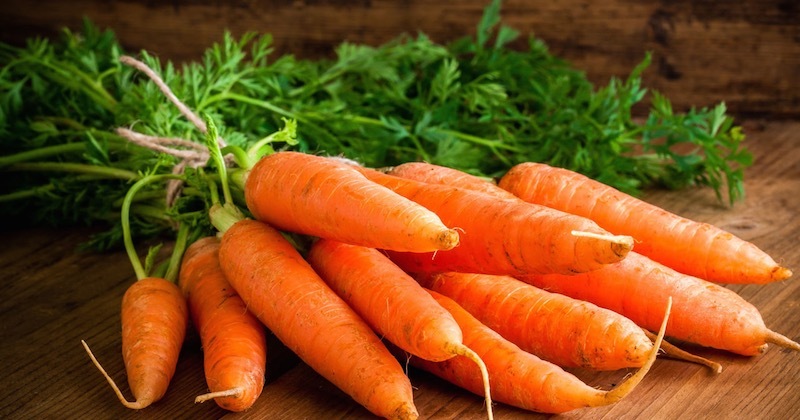 Beta-carotene is responsible for the brilliant orange hues of carrots, although carrots also come in various other colors, such as white, yellow, purple and red. Whenever you can get hold of purple carrots, do include them in your juicing. Purple carrots have an additional phytonutrient that is anthocyanin, that gives the carrot its purple colour. Anthocyanin is a rich antioxidant that fights free radical damage and is great for strengthening your immune system. Red carrots have more lycopene than the regular orange carrots as lycopene gives the red carrot its colour. Lycopene is an antioxidant that is protective of heart health and blood pressure, among its many health benefits. The lighter-colored carrots, white and yellow, have less beta carotene but are rich in the other nutrients that their counterparts have. Carotenoid compounds play an essential role in human health, preventing diseases with their antioxidant capacity, and also as provitamin A. As our bodies do not make carotenoids, they have to be obtained from a plant-based dietary. For therapeutical purposes, I recommend drinking carrot juice instead of eating them whole. When you eat whole carrots, your digestive system may not be able to absorb as much of the nutrients, as compared to drinking carrot juice. And, you will have to eat many pounds of the carrots in order to obtain sufficient nutrients for healing of ailments. That would not be practical. On the other hand, when you drink carrot juice, your digestive system is able to assimilate almost all of the nutrients, giving you that extra mileage for healing of ailments. Drinking a glass of carrot juice every day will do much more for you than many bottles of supplement tablets. Consuming foods that are highly acidic will cause your blood to be acidic, potentially lowering your immune system and increasing the chances of developing a chronic disease. The key to fighting and preventing diseases then, is to create an alkaline environment in your body. Carrots are alkaline-forming, making it an excellent food for reversing symptoms of acidosis (over-acidity). Carrot’s molecules are closest to human’s hemoglobin molecules, making it very beneficial in blood-building. If you want to drink fresh juices to treat anemia, this is the best combination to quickly boost your iron levels: carrots and beetroots (use equal amounts in weight). Due to carcinogens and free radicals in cigarettes, oxidative stress in smokers are raised, thus depleting nutrients in the body that eventually leads to DNA damage, and higher risks of chronic diseases. In a study, smokers who were given fresh carrot juice to drink for a period, were found to have reduced DNA damage (50% and above) compared to before supplementation. When they were given slightly boiled carrot every day for two weeks, it had no effect on the DNA. It was observed that the activity of beta-carotene was reduced with storage, so fresh juice is preferred. The study concluded that supplementation of carrot juice as a food, which contains ample antioxidant nutrients including vitamin C, may be used to prevent diseases caused by oxidized damage in smokers, and individuals who inhale second-hand smoke. 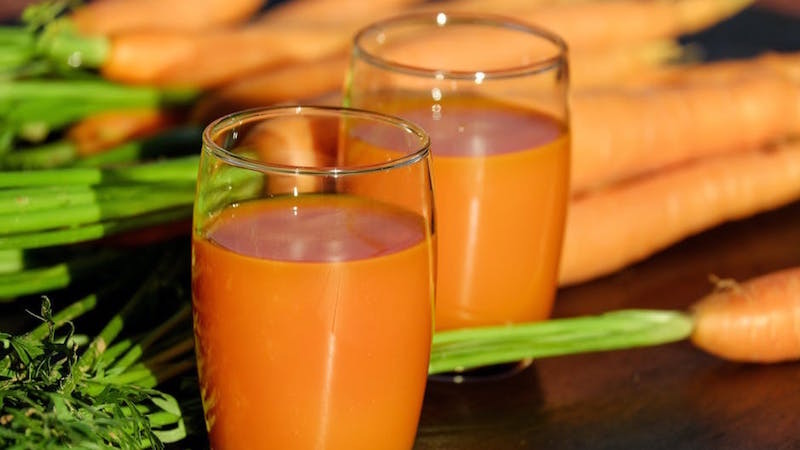 Carrot juice is used in many detox programs, such as the Gerson Therapy, for fighting cancer. The miraculous health benefits of carrot juice have been proven many times over, of its deep detox and cleansing abilities. Ann Cameron cured her Stage 4 cancer with only organic carrot juice, without chemotherapy or radiation. She went on to write a book that describes the details of her carrot treatment, providing scientific evidence for the miraculous health benefits of carrot. Get her book here: Curing Cancer With Carrots. According to Ann, the important compound that affect induced cancer in lab rats in experiments, was a polyactylene, falcarinol—which is not an antioxidant. This compound is found in the highest concentration in carrot peel, and has been reported to reduce tumors successfully. Some recent studies have shown that a diet high in carotenes are protective against cancers of the prostate, colon, stomach and breast. The high content of antioxidants in carrot juice, from the variety of phytonutrients, fight free radicals and act as an anti-aging agent that makes your skin healthy and vibrant. When you drink a glass of carrot juice every day, it is very cleansing to the liver, gradually removing toxins. Your liver health will be evident when it gives your face that glow, and blemishes will begin to disappear. Vitamin C in carrot juice is essential for helping with collagen synthesis in your body. So, drinking carrot juice every day will firm up your skin, preventing premature aging. Another health benefit of carrot for skin, is its ability to repair tissues damaged by UV rays from the sun. It also protects the skin from the harsh rays and heal the skin of inflammation. A deficiency in vitamin A is the leading cause of poor eyesight, thus the reverse is true: Eating foods rich in pro-vitamin A provides special protection against astigmatism, macular degeneration and cataracts. You may have read that vitamin A is toxic at high levels, but that is referring only to supplementary sources (synthetic). Dietary sources of vitamin A (from natural foods such as carrots) is non-toxic at all, as your body will only make vitamin A from the pro-vitamin when it is needed. An experiment was conducted to evaluate the effects of carrot juice on cardiovascular health. 17 participants were given 16 fl oz of daily freshly-extracted carrot juice for three months. At the end of the study, it was observed that there was a significant increase in antioxidant status and reduced oxidation of blood lipids. A 5% reduction in systolic blood pressure was also observed. High cholesterol is not a health issue, but oxidation of the cholesterol is what causes heart disease. Drinking carrot juice prevents oxidation of cholesterol. Consuming high-antioxidant drinks such as carrot juice, provides excellent protection to the arteries by inhibiting oxidation of LDL protein, and cleansing of old arterial deposits. This strengthens cardiovascular health, prevents atherosclerosis, heart attack and strokes. Carrot juice is my go-to drink for any issues with the respiratory health. It has been proven to be beneficial for individuals suffering from asthma, coughing, sinusitis, nasal congestion, and dispelling mucus/phlegm from the ear, nose and throat area. You may have noticed that when you drink cow’s milk, it causes your sinus or chest area to feel congested. Avoid cow’s milk and drink carrot juice instead—it helps to break down the mucus and stops the congestion. Drinking carrot juice can also help to reduce snoring as it helps to clear your airways and reduce congestion, allowing you to breathe better during the night. If you snore, make this easy juice to reduce snoring. In Dr Norman Walker’s book: Fresh Vegetable and Fruit Juices, he had carrots in almost every recipe for any type of ailments, but each with slightly different combination with other fruits or vegetables. Dr Norman Walker recognized the miraculous health benefits of carrot juice. For regulating chronic constipation, he suggested simply carrot and apple juice. I have tried this combination with a few clients and it worked wonders, every time! Use equal amount of carrots and apples in weight, juice and drink daily on an empty stomach, before meals. The powerful phytonutrients in carrots, make carrot juice an excellent drink to be included in your diet, if you are prone to catching a cold easily. Antioxidants in huge amount is what you need to boost your immune system. Carrot juice contains properties that help to fight free radicals and pathogens (harmful microbes), while nourishing and healing your body. The healing properties in carrot juices are helpful for cleansing and filtering the kidneys. Although many juicing “experts” say that people with kidney failure shouldn’t drink juices, this story tells you volumes, about the miracle of carrot juice for kidneys. Studies have shown that carrots lower the risks of prostate health. Daily consumption of carrot juice for its rich nutrients prevents cancer in general. Vitamin C and antioxidants are major contributors to the health of men’s sperm quality and count. Carrot juice is one of the best juice for treating male infertility. If you are a nursing mother who is not producing enough milk, you can easily improve your breast milk flow by drinking carrot juice. Carrot juice will not only help to improve the quantity, but also the quality of the breast milk. For even better result, use equal amount of carrots and fennel bulbs in weight, juice and drink a glass every day to increase lactation. During pregnancy, drink carrot juice daily to ensure that you supply all the necessary nutrients to your growing fetus. Choose to eat only healthy, nutritious foods for a healthy pregnancy and baby. Should you eat raw or cooked carrots? To enjoy the full health benefits of carrots, it is best to eat raw carrots vs cooked. Although the phytonutrients and minerals don’t get destroyed when cooked, raw carrots contain enzymes and vitamins that get destroyed in high heat. Is it better to eat carrots or drink carrot juice? For therapeutic use, it is best to drink raw carrot juice as it allows your digestive system to assimilate almost ALL of the rich nutrients in carrots, for healing of ailments. Using a slow juicer even helps to remove most of the pesticides and chemicals from the juice. However, for cancer patients, please use only organic carrots. How many carrots should you eat a day? As much as you want, and can comfortably eat. “Comfortably eat” is key. You can never eat too many carrots. Listen to your body, never eat more than your body can handle—that would be too much. Carrots are so rich in a wide variety of nutrients that your body needs. How to choose sweet carrots? Whenever possible, always buy organic carrots, and from your local farmer’s market for optimal nutrients and freshness. Carrots that are no longer than 6 inches tend to be sweeter. So choose the shorter variety if you like it sweet, or the longer one if you prefer it less sweet. Of course, for juicing, you may like to choose the larger variety of carrots. How much carrot juice should you drink a day? As discussed above, one glass of carrot juice a day helps prevent many ailments and diseases. However, if you want to drink carrot juice for therapeutic purpose, then 3-4 glasses a day is not too much. One pound of carrots make about 10-12 ounces of juice using a slow juicer, so you may buy carrots accordingly for how much you wish to make. In Gerson Therapy, cancer patients do coffee enemas five times a day to eliminate toxins, and drink up to 13 glasses of carrot juice a day (one glass every hour). What is the best time to drink carrot juice? Ideally, it is best to drink fresh juices in the morning, on an empty stomach before a meal. This is the best time that your body will assimilate all of the nutrients that you consume. When drinking juices throughout the day, always drink at least 15 minutes before a meal, or two hours after a meal for best assimilation. Baby carrots are not “real” baby carrots. They are shaped into these little sizes from “deformed”, broken and imperfect carrots to avoid wastage. In the process of shaping the baby carrots, the skin is shaved off, causing them to be without their protective skin that prevents them from premature rotting and bacterial attack. As we discussed above, the compound falcarinol found in the highest concentration in carrot skin, is key in fighting cancer and shrinking tumors. 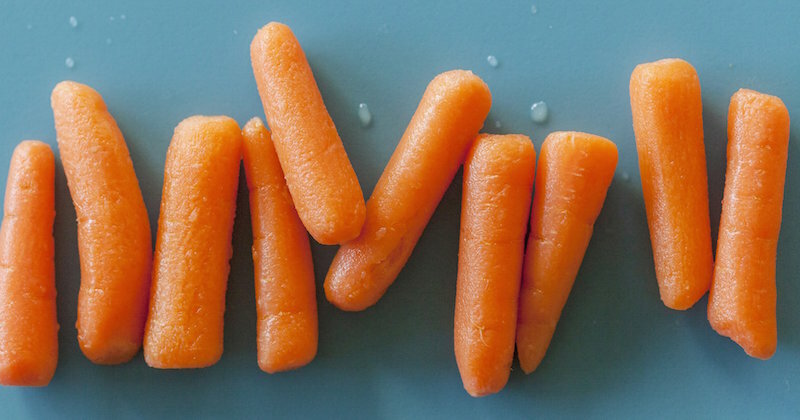 With the skin shaved off of baby carrots, the best cancer-protective nutrient is also removed. Since the skin is shaved off and the baby carrots no longer have a protective layer, they are then required to be dipped into chlorine to disinfect them from bacteria. Some people think that chlorine is no big deal. So what, you’re exposed to tap water and swimming pool water which are all chlorinated, why should you worry about this little chlorine? Chlorine content in drinking water and swimming pool water is about 2-4 ppm. For dipping these baby carrots, about 50-150 ppm chlorine is used. Chlorine is a persistent, toxic chemical that doesn’t break down. When ingested, it becomes a toxin that, in accumulated amount, may cause health issues. Knowing these facts about baby carrots, you may want to avoid eating them if possible. Why Do You Turn Orange From Drinking Carrot Juice? You may have heard of people “turning orange” as a “side effect” of drinking carrot juice. Rest assured that this is not a side effect, in fact there are many “side benefits” of drinking carrot juice. Intestinal and liver diseases are sometimes due to a lack of certain of the elements contained in properly prepared raw carrot juice. When this is the case, then a noticeable cleaning up of the liver may take place, and the material which was clogging it may be found to dissolve. Frequently, this is released so abundantly that the intestinal and urinary channels are inadequate to care for this overflow, and in a perfectly natural manner it is passed into the lymph for elimination from the body by means of the pores of the skin. This material has a distinctly orange or yellow pigment and while it is being so eliminated from the body will sometimes discolor the skin. Whenever such a discoloration takes place after drinking carrot or other juices, it is an indication that the liver is getting a well-needed cleansing. 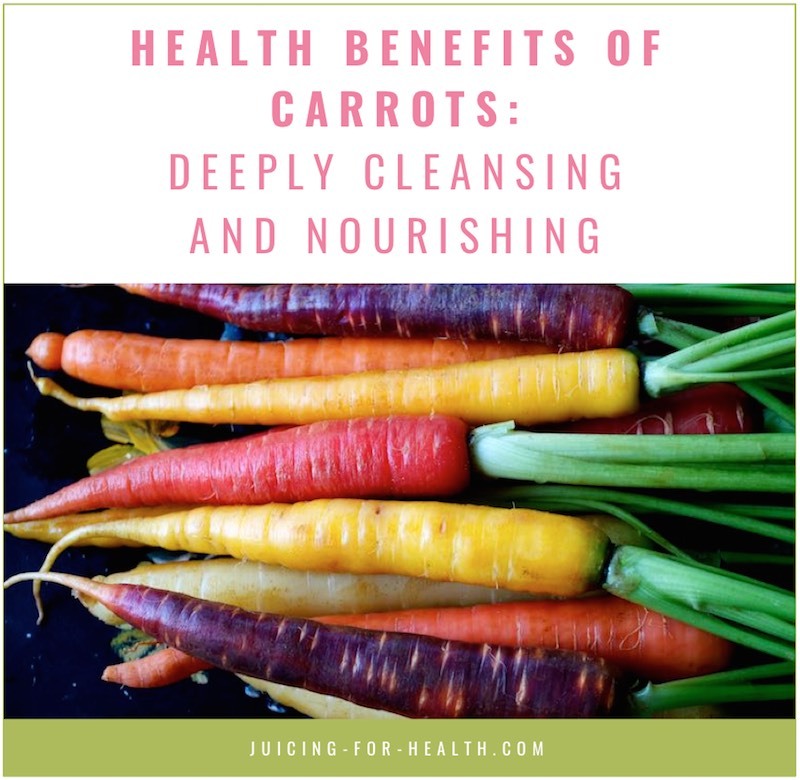 It is NOT the carrot juice itself nor the carotene that comes through the skin, as this discoloration will take place even if the juice is filtered to the point of clearing it of all color pigment. It is just as practical an impossibility for the carrot pigment itself to come through the skin as it would be for the red pigment of the beet to turn the body red or the chlorophyll of the green vegetables to paint the skin green from within.